The Mindanao State University at Naawan is mandated and is granted support by the Commission on Higher Education (CHED) to implement the extension project entitled Building Resilience and Poverty Alleviation Through Tilapia-Based Skills and Livelihood Development in Northern Mindanao. The Division had conducted a protocol meeting on December 2016 to the responsible agencies like, BFAR and LGU’s. The site selection survey was carried out for the potential establishment of the project in their existing bodies of water. Specifically, the target partners would be people’s organization that are willing to spearhead a tilapia-based project. 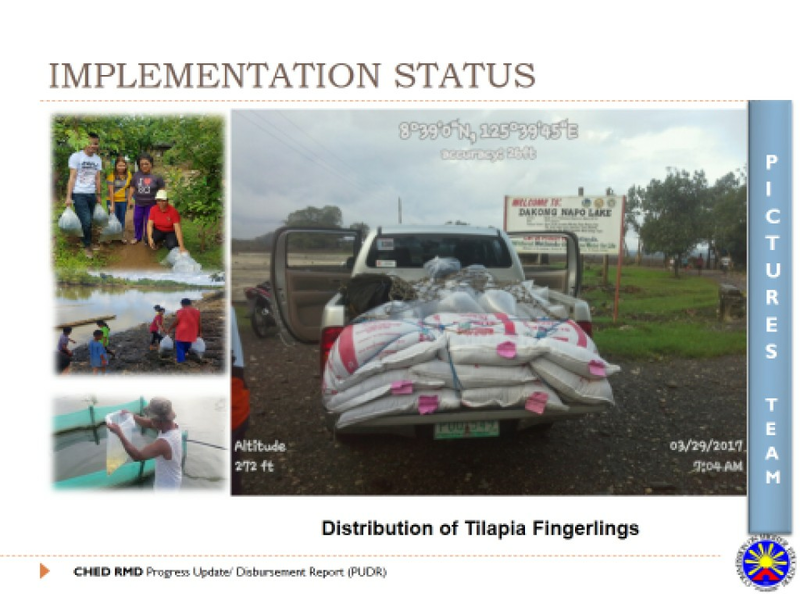 The Division had teaching them the technologies on tilapia fingerling hatchery, tilapia grow-out and tilanggit production under existing local conditions. The project endeavors to teach beneficiaries the skills that will equip them to engage in tilapia industry and to initiate a tilapia-based livelihood with the ultimate objective of building their resilience amidst environmental challenges and alleviate their economic condition. A survey of people’s organizations was carried out and evaluation of site was conducted to determine appropriate areas for the project. A total of 13 people’s organizations and a Fisheries school distributed in Regions 10 and Caraga were chosen as partners in the various facets of the project. The project was specifically implemented in Barangay Buru-un Iligan City, Barangay Managok, Malaybalay City. For Caraga Region, Agusan del Sur includes the barangay of Guadalupe, Piglawigan and Nato in the municipality of Esperanza; barangay of Himbang, Buena Gracia and Marbon, municipality of Talacogon, Agusan del Sur and the barangay Poblacion, San Luis, Agusan del Sur. Hands-on trainings was carried out in tilapia hatchery, tilanggit production and tilapia grow-out using the facilities of MSU-Naawan. Upon return to their site, the project assisted them in the establishment of their own livelihood, applying the skills acquired during the training. Where necessary, start-up materials were provided, mainly in the form of fingerlings, and cage materials and start up feeds for some that were very new in the industry. For sustainability, the activities engaged the participation of the LGU’s, DSWD, DTI and BFAR. The target includes at least 90 vulnerable households. Resilience and poverty alleviation will be in terms of an increase in income of the household beneficiaries, reduced hunger incidence, improved health conditions of communities, creation of job opportunities among fish vendors, building the entrepreneurial skills of women, to sustain and transform the project into a regular source of livelihood. The project was run for a year with an overall objective of contributing to the income, food security and nutrition of vulnerable households in Northern Mindanao through Tilapia-based skills and livelihood development and to contribute to resilience building of the fishery ecosystems and the communities dependent on them amidst potential impacts of climate change.